Heriot’s and Mazars Grange made the most of home comforts on Saturday to collect victories and remain undefeated in the CSL Eastern Premier Division l.
They both have three wins from three now after Heriot’s saw off Carlton at Goldenacre and Grange got the better of Watsonians at Portgower Place. Captain Ali Evans and young Shiv Gupta bowled well at the start for Carlton, but 70 from Peter Ross helped to drag Heriot’s up past the 150 mark and he was well supported by Michael Shean. The latter hit 37 as Heriot’s posted 174 all out, but good bowling by Carlton spinners Adeel Raza and Arun Pillai, who took three wickets apiece, meant that the hosts did not use 6.1 of their allotted overs. In Carlton’s reply, Elliot Ruthven opened the bowling for Heriot’s and was right on the money early on. He took the wicket of Kyle Macpherson, and then spinner Ryan Brown weighed in with two scalps to leave the visitors on 30-3. Teenager Tom Simpson and Ruairi Macpherson dug in with 24 and 27 respectively, but in the end they were 128 all out with Brown and Heriot’s skipper Keith Morton both taking three wickets. Over in Stockbridge, Watsonians batted first against Grange. By the time key man George Munsey was out for 11 they were struggling on 82-5. Oli Brown battled for 23 not out batting at nine, but the Grange bowling was solid and restricted the visitors to 167 all out. Neil McCallum, the former Scotland man, took three wickets. Grange had little trouble in knocking off the required runs in reply, Nick Farrar carving out 52 and McCallum knocking off an unbeaten 35 seeing them home by six wickets. “I thought it was a solid all- round performance from the team,” Grange captain Preston Mommsen said. “Early on we did a great job with the ball and in the field, we knew that the wicket was a good one for batting on so we had to put them under pressure. Teenager Patrick Ritchie could also be happy with his day’s work as wicketkeeper for Grange too, taking one catch behind the stumps and being the latest product of the club’s Academy system to come into the top team. At the other end of the experience scale, Stuart Davidson bowled a very tight spell of 1-15 from 10 overs. The result leaves Watsonians second bottom and winless to date while Stewart’s Melville are at the foot of the table after a home defeat by Forfarshire. The Stewart’s Melville batting line-up has struggled to fire so far this summer and it was the same again at Inverleith. Batting first, they could only post 126 all out, Steven Parker making 32, but it was never going to be enough against a Forfs side with a quality top order. 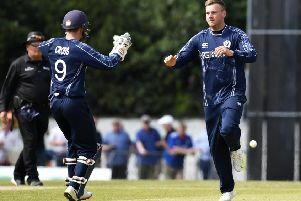 And so it proved, Scotland all-rounder Michael Leask hitting 47 not out to lead the men from Broughty Ferry home by seven wickets. RH Corstorphine could not back up last week’s win over Glenrothes up at Aberdeenshire. The visitors batted first at Mannofield and managed to get up and over the 200 run mark thanks to solid contributions from four batsmen. Sam Flett led the charge with 82 and he was given good support from opener Arnie Sathiy (35), Majid Haq (33 not out) and new pro Hammad Azam (31). That meant they scored 209-6 from their 50 overs. In the home side’s reply, Haq took a couple of wickets as did RH Corstorphine skipper Joe Kinghorn-Gray. However, 76 not out by Aberdeenshire’s Akshu Merengnage and a half century by Ian Kirk saw them win by four wickets.